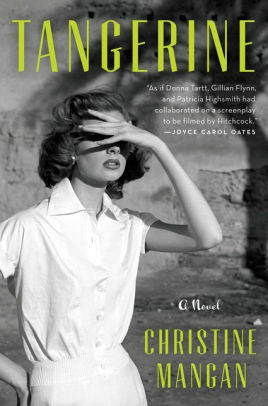 Tangerine by Christine Mangan is a recommended historical fiction suspense novel set in Tangier, Morocco, in 1956. Alice Shipley has moved to Tangier with her new husband, John McAllister, for his job. McAllister is an obnoxious, disagreeable man who married Alice for her money. He loves Tangier and is always off doing something in the city, while Alice finds the city terrible and oppressive. She is not adjusting to life there at all. However, the last person she expected to show up in Tangier for a visit was Lucy Mason, whom she hasn't spoken to for over a year. Alice and Lucy first met when they were freshman at Bennington in the early 1950s. The roommates became inseparable and were the best of friends - until an unnamed accident happened and the two did not part on good terms. Now, Lucy has traveled to Tangier specifically to see Alice. Alice is surprised to see her after whatever mysterious incident happened between the two. What is clear is that Lucy closely watches everything and always has, and that she is obsessed with Alice. The setting adds to the oppressive feeling, as Alice struggles with the heat and foreignness of Tangier. The writing is wonderfully descriptive. The setting is meticulously detailed, creating an atmospheric setting. The story develops in chapters that alternate between the the two women's point of view, and describe events in the present and the past. It is the unnamed, mysterious accident/incident that happened between the two while they were in college, combined with Lucy's obsession with Alice that creates the feeling of tension. There is an almost Hitchcockian aura surrounding the plot and dialogue. As I was reading Tangerine a feeling persisted that I had read this novel before, or had seen this film before - only the elusive-unnamed-original was better than this novel. The trouble is that the tension and drama is based on the big secret, which is so slow to be revealed that it actually offers no huge surprise. Astute readers will likely have felt the same as I did from the beginning and have an excellent idea where the plot is going long before it meanders that direction. Additionally, even though the two women are described as being very different, sometimes it is hard to tell whose voice you are reading, which is disconcerting. What I do think is true is that this book will make a good movie - which is probably why the film rights have already been sold.